The gradebook just got a new Quick Export option! If you want a quick and easy way to download total participation and correct answer points for your class, just navigate to the Export tab in gradebook and Quick Export is now the default export option. 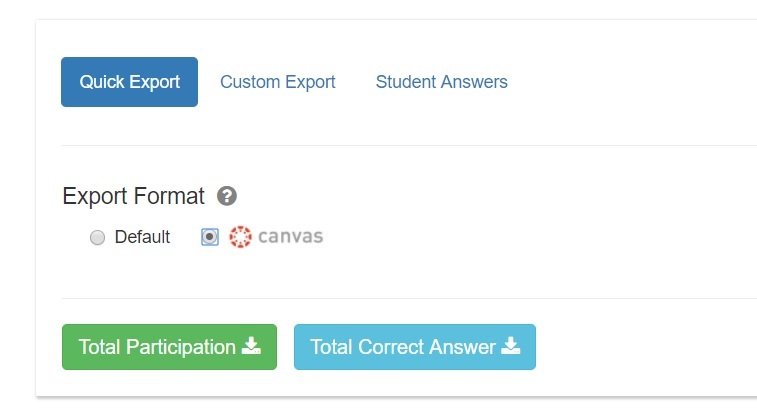 Do you use Canvas (https://canvas.instructure.com/) to manage your class? Say goodbye to tediously editing excel files because Quick Export now has a Canvas formatting option! We plan to add more online gradebooks to Quick Export in the future. Please email us at [email protected] to let us know which ones you use. The gradebook still has a Custom Export option for those times when you need to export specific dates or combine participation and correct answer scores into a single file. Just click Custom Export at the top of the Export panel.